The combination of club soda, syrup and ice creates some serious fizz. This drink is so delightful and thirst quenching. You can make the syrup ahead of time and keep it in the fridge up to a week! Rinse, drain and pit your cherries. 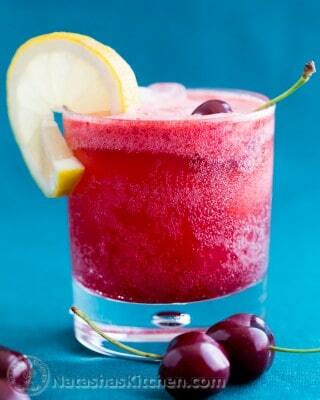 In a blender, combine 3 cups pitted cherries, 1 cup freshly squeezed lemon juice and 1 cup sugar. If you're cutting down on sugar in your life, feel free to use 3/4 cup sugar. Blend until smooth. You don't want pieces of cherry to get stuck in your straw. Fill a glass half way with ice. Pour 2-3 Tbsp of your cherry syrup over your ice and add club soda to taste. It's usually 1/4 cup syrup to 3/4 cup club soda. Top with a fresh cherry and serve. You're gonna love the fizzle. My sisters both said this was restaurant quality except WAY cheaper!